Beloved Los Feliz establishment Alcove and Big Bar will once again throw an epic Game of Thrones party transforming their multiple patio and interior spaces into Westeros and beyond. Stop by (Big) Bar Island, a nod to Bear Island where a bevy of GOT themed cocktails will be served. Guest will be greeted by a hooded figure and possibly a hall of faces at Gazebo of Black and White. There, you will find the test: a clear potion served from a wooden bowl drink and know your fate. Wine lovers can visit Cersei’s Cellar, offering the official GOT wine with Cersei sized pours. Step into The General’s Tent aka the map table and pledge your allegiance to a house. Your answer will determine the special and rare single malt scotch pour you’ll receive. Lastly they have built a wall just for this occasion. Prepare to go North of the Wall where the land is always winter. There, you will find a white walker highball station and rumors say even a giant Ice Dragon Luge! 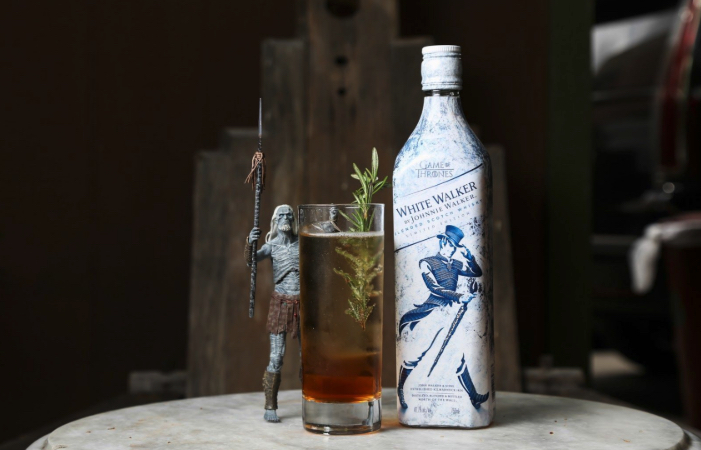 Blue dragon fire cocktail chilled through the luge and made with Jonnie Walker White Walker will be served. A major surprise we are not allowed to reveal at time will happen around 8 to 8:30 p.m. Let’s just say it was inspired by the last episode of season seven. You won’t want to miss this. Admission to the party is free. All beverages are paid for by tokens you can purchase through the cocktail staff or at the Alcove counter. It cost $16 per token ($1 of which go to the hard working staff).